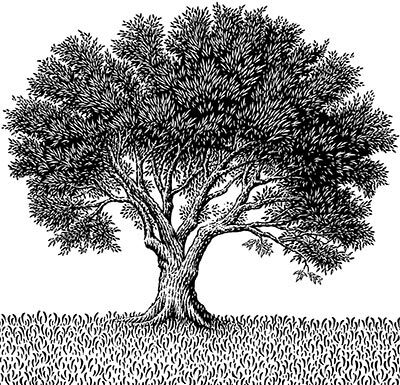 Israel – The natural olive tree from which Christianity comes from. “has God cast away His people? Certainly not! God has not cast away His people whom He foreknew.” In the following verses he also warns gentile Christians not to be proud or haughty against the Jewish people, but be grateful to God that they were given the privilege to be “grafted in” to God’s covenant with Israel. I’ve heard some prominent pastors and preachers who are making anti-Semitic statements against Jewish Christians and the State of Israel. This is a dangerous error on their part because God Himself takes offense. He will judge their ministries and churches if they do not repent from preaching and teachings doctrines that are unbiblical. Regarding the Jewish people, He promised Abraham and his descendants long ago, “And I will bless them that bless thee, and curse him that curseth thee…” –Genesis 12:3. Categories: ISRAEL IN THE NEWS | Permalink. I recently came across the following article on the Spanish website www.Semana.com. This reliable editorial details the latest revelations on the true ancestry of Christopher Columbus (Cristóbal Colón) and the primary motivation behind the discovery of The Americas. It further confirms my own Jewish ancestry that dates back to the migration of Spanish Jews to the island of Cuba onboard the voyages of Columbus. Christopher Columbus was not of Italian nationality as previously supposed. He was actually a Spanish Jew who went to great lengths to hide his Jewish-ness by obscuring his childhood records. However, much of Columbus’ personal correspondence contained reference to King David of the Bible, the often used term “Bet Hei” (which is Hebrew for “with God’s help”) and his letters were written from right to left in the Hebrew reading fashion, instead of left to right. During this period in history, the Spanish Inquisition was in full force. The powerful Roman Catholic Church in Spain was arresting, imprisoning, torturing, and burning alive all Jews in Spain who refused to convert to Roman Catholicism. It is estimated that as many as 120,000 Jews fled from Spain to avoid the persecution. Many of these Jews traveled on Columbus’ voyages and populated the countries of Cuba, Puerto Rico, Jamaica, Hispaniola (today Dominican Republic/Haiti), Venezuela, Panama, Honduras, Mexico, and many other islands in the Caribbean. Columbus himself is buried in the Dominican Republic. Many Jews who remained in Spain changed their Jewish names and identities to avoid persecution. They also pretended to convert to Roman Catholicism while practicing their own Jewish religion in secret. These new Jewish converts were nevertheless labeled “Marranos*” (swine or pigs) and Christopher Columbus is believed to have been one of those professing conversion while remaining a secret Jew. Columbus’ first voyage set sail from Spain on August 3, 1492. It is believed this date was deliberately chosen to commemorate the anniversary of the destruction of the two Jewish temples in Israel. Contrary to previous opinion, the voyages of Columbus that resulted in the discovery of the Americas was not financed by the Catholic kings Fernando II de Aragón and Isabel I de Castilla, but by the wealthy Jewish community (Marranos*) who remained in Spain. 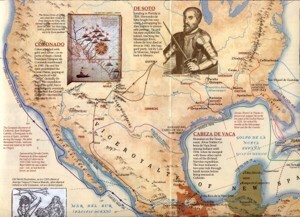 Map of Spanish colonization of North America many years before the English Puritans landed. 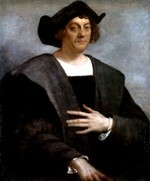 Christopher Columbus made a total of four trips to the Americas during 1492-1504. It is believed that during these trips to the Caribbean Islands and Central and South America, hundreds and thousands of Jews disembarked and began lives in the new world with religious freedom. It’s no wonder that these new colonies began to thrive under God’s favor. God has historically blessed the nations that supported the Jewish people. Could it be that these countries were blessed of God because of the first Jewish inhabitants? Let us remember that the United States was first colonized by Jews from Spain in the areas of Florida (Spanish word meaning “Feast of Flowers”) and other parts of the U.S. eastern coastline. It is quite possible that the United States was blessed of God – not only because of the English Puritan colonists, but also because of the first Spanish-Jewish settlers. There are many Jewish Cubans (nicknamed “Jewbans”) like myself who’s ancestors first settled on the island of Cuba fleeing the Spanish Inquisition in the 15th Century. Here is a new version of Hava Nagila performed by Cuban singers and dancers (possibly descendents of Spanish Jews) within a backdrop of Old Havana, Cuba. In this video, they have incorporated the Cuban “salsa” rhythms. “Hava Nagila” (Hebrew: “Let Us Rejoice”) is a popular Hebrew folk song that is traditionally sung at Jewish weddings, and Bar Mitzvah’s. Una exposición muestra que el descubrimiento de América habría sido financiado, no con las joyas de la reina Isabel, sino con dineros de la comunidad judía, a la cual pertenecería, además, el descubridor. 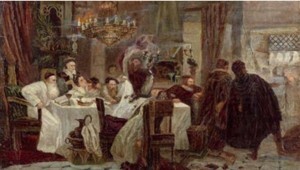 Marranos: Secret Passover Seder in Spain during the times of the Spanish Inquisition, painting by Moshe Maimon. * Marranos (Spanish: [ma-rranos]; were originally Jews living in the Iberian Peninsula who had been forced to convert to Roman Catlocism, some of whom may have continued to observe rabbinic Judaism in secret. The term came into later use in 1492 with the Castilian Alhambra Decree, reversing protections originally in the Treaty of Granada (1491). The converts were also known as Cristianos nuevos (Spanish) and Cristãos novos (Portuguese), which mean New Christians, and conversos (the converted). The term Marrano derives from Arabic muarram; meaning “forbidden, anathematized”. Marrano in 15th century Spanish first meant pig, from the ritual prohibition against eating pork, practiced by both Jews and Muslims. Marrano in Spanish still means pig and dirty, but it is no longer commonly related to religious beliefs. Although originally the term was used by common people, the insult was mostly racist. Marrano acquired connotations of “filthy-dirty” (sucio) and “unscrupulous” (sin escrúpulos) during the time of the Spanish Inquisition, when the term was used to impugn the character of the recalcitrant crypto-Jew. In contemporary Portuguese the word refers only to crypto-Jews, with marrão meaning the animal pig or swine. Today, even among Jewish historians, the term ‘marrano’ is no longer considered correct. The preferred terms are ‘anusim’ (Hebrew for “forced”); or ‘conversos’ or ‘conversas’ (Spanish) for men and woman respectively (singular ‘converso’ and ‘conversa’). Categories: ISRAEL IN THE NEWS, Was Christopher Columbus Jewish? | Tags: 1492 Voyage, Christopher Columbus, Colonization of Americas, Cristobal Colon, Crypto Jews, Cuban Jewish Ancestry, Favor, Genesis 12:3, God’s Blessings, Hava Nagila, Havana Guila, Jewbans, Marranos, Middle East, Persecution of Jews, Religion, Roman Catholic Church, Spanish Inquisition | Permalink. to the complete audio message. 1948 when the United Nations granted a homeland to the Jewish people and the Nation of Israel was reborn. 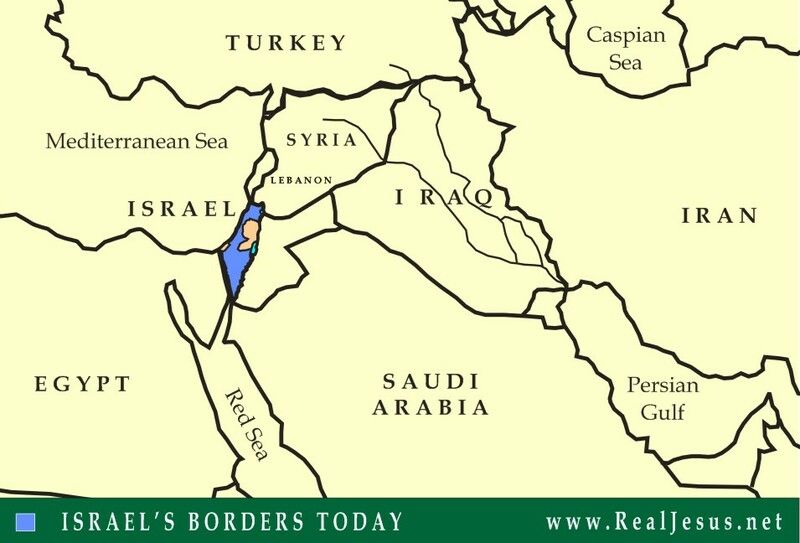 However, the land that the State of Israel occupies today is only a fraction of the entire amount of land actually promised by God. 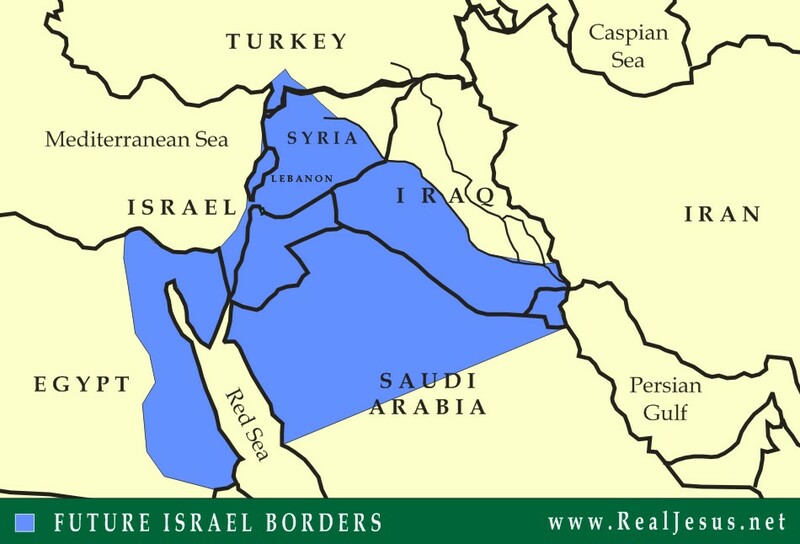 Yehovah God didn’t promise the Jewish people Pre-1967 borders, He promised them the entire land of Israel – from the Egyptian River as far as the River Euphrates. 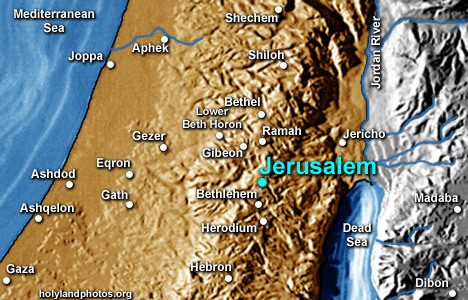 When Jesus the Messiah returns again, the Nation of Israel will have its land restored to the fullest. Jesus the Messiah will return and restore the Jews to the land of Israel from all the nations in which they were scattered. Categories: ISRAEL IN THE NEWS | Tags: bible prophecy, Genesis 15: 17-21, God’s Promise to Abraham’s descendents, Isaac, Jacob, Jeremiah 16:14-16., Jesus Christ, Jesus the Messiah., Jews, Land, Messiah, Middle East, Nation of Israel, Religion, Restoration, Second Coming, State, Yahovah God | Permalink. 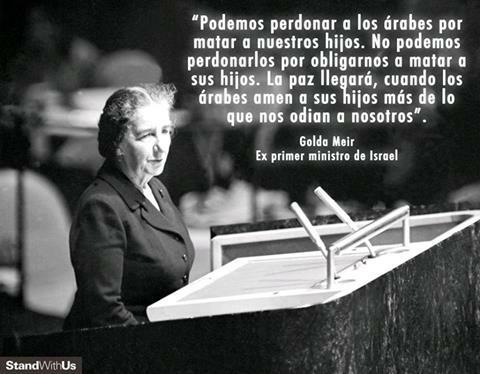 “We can forgive the Arabs for killing our children. But we cannot forgive them for obligating us to kill theirs. Peace will come when the Arabs love their children more then they hate us”. Categories: ISRAEL IN THE NEWS | Tags: Israel, Jewish People, Middle East Peace, Terrorism | Permalink. Please pray for peace (Hebrew, “Shalom”) which includes prosperity, may prevail in Jerusalem. This is God’s will for all Christians regardless of your denominational background. Jesus Christ the Messiah is coming again very soon and will establish His earthly rule from this holy city. Categories: ISRAEL IN THE NEWS | Tags: Christian Prayer for Israel, Earthly Rule, Holy City, Jerusalem., Jesus Christ, Messiah, Psalm 122:6 | Permalink. The call of Abraham is the story where biblical prophecy starts, not only for the Jewish people, the nation of Israel, but also for us as Christians. It’s the calling of God on a man who would shape human history. Four thousand years later, we can stand in Jerusalem and see the fulfillment of the great blessings promised to Abraham and his true descendants, the children of Israel. And if you have faith in Jesus Christ, you are a son of Abraham and are also blessed. Categories: ISRAEL IN THE NEWS | Tags: Blessing & Curses, Descendants of Abraham, Jerusalem., Jewish People, State of Isarel | Permalink. Show your support of Israel’s right to defend itself from terrorists. Pray for the peace of Jerusalem. “Like” this post and share your comments below. Categories: ISRAEL IN THE NEWS | Tags: Jewish People, Pray for the Peace of Jerusalem, Psalm 122:6, Right to Defense against terrorists, Stand with Israel, Support Israel | Permalink.